I’ve searched and maybe I’m not searching for the right thread, but I’m struggling to get a fixed schedule setup to run with newly seeded areas. What I have historically done with my old controller was manually program to start watering about every two hours for a few minutes to keep the seed moist. I would start around 4 a.m. and end about 8 p.m. I can’t seem to find a way to schedule that, when I do fixed with hourly I can’t select bounds for start/stop and it schedules it running 24/7. Any ideas how to address that? Laura - I looked through that article but it doesn’t solve what I’m after. I don’t want to water 24/7, rather, I want to water between a certain window such as 4 a.m. to 8 p.m. I can set this up manually by create a bunch of fixed schedules to start at a specific time, but I would think the app would be dynamic enough to do that automatically. When I go through the method on the support article it starts at a certain date and ends on a certain date. Even when I selected don’t run past 8 p.m. it still continued to schedule all through the night. Your best bet is to create a fixed schedule with a specific start time and set a manual cycle soak of 2 minutes cycle per zone (18 minutes duration for each zone) and a soak period of 2 hours. Franz, thanks, that is exactly what I am looking for. However, I can’t recreate what you did. 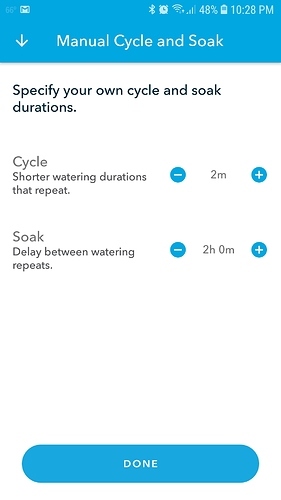 I have it set at 2m cycle and the app won’t let me go past 1 hour for the soak. What did you do to get it to two hours? I also attached a screen capture, after I set the soak to an hour with those durations it only scheduled from 4 am to 9am. Franz - I figured out the issue with the amount of times it watered using those settings, but I still can’t get it to a two hour gap, the web app and mobile app both cap me out at 1 hour. Interesting! Good find, look forward to the fix so I don’t have this problem next fall! That’d be great if you can adjust the Fall Seeding to 2 hours for me. I can take the rest from there. I’ll try to fix that and get it into the need release. I did something similar by setting up a fixed schedule on intervals. I have 14 zones that I’m trying to reseed. I determined I needed 4 intervals between a certain time if the day and the app took care of the rest. 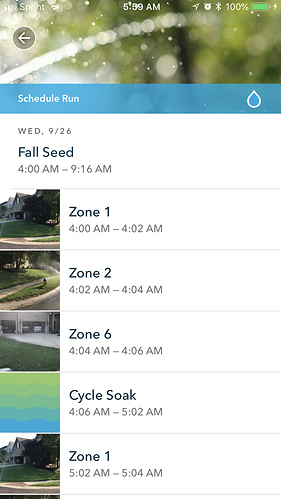 I set the start and end dates based on advice from my yard guy. I can easily extend the schedule or run Just that schedule a-la-cart it I need to. A couple of my zones are very Streep so the shaking feature set up in the zones is also implemented in the intervals. I think I’m missing something. I want to water every 4 hours between 6AM and 6PM. I can’t figure out how to start and stop on the same fixed, manual cycle soak schedule. it looks like I need to choose the start or end time - not both. Is my only choice to water for 24hrs? Is my only choice to water for 24hrs? Unfortunately “yes” for now if you pick an hourly schedule. If you pick a fixed schedule with a start time (6AM) you can use the manual cycle soak feature and essentially use it to water every X hours (the soak time) and also use it to water (cycle) for a limited amount each period. In your case you can pick a soak time of 4 hours and then just pick how much each cycle you want the zone to water. At some point we will add start/end times to the hourly schedule. I agree they should have those settings. I have a similar problem, but I need 1 of my 4 zones to have a different amount of time (e.g. 8 minutes for zones 1,2,3, but only 5 minutes for zone 4). I could create 2 programs (i.e. z1-3=8minutes, and z4=5m), but I feel I should be able to have 1 program “new grass” that I can schedule, or stop, or pause, etc.